It’s been a few months now since I was more than proud to accept and take on the role of road captain. It is a position that I regard as a great honour and responsibility and so far the role has been to turn up at as many Red Rose events as possible and be as supportive as I can be. The way which we wait for our last runner fills me with pride and is a credit to us as a club. To date I can’t recall any of the other clubs doing this. Our turnouts for the interclub events is awesome and I’m sure is the envy of all the others clubs. Club photos are getting so big we are going to need a wider lens camera and a good Shepherd to herd everyone together. The recent supermodel posed pickies make me smile and I think show the best side of Red Rose. We can race and socialise like no other club. On the running and racing side this appears to be going from strength to strength, we have had many ladies and gents team prizes as well as individual prizes. We regularly have ladies and gents in the podium places and if certain veteran prizes aren’t picked up it comes as a great surprise. Looking at recent parkrun and race times many, many of us are improving no end which makes me think we must be doing something right regarding training. I’m more than impressed at the way quite a few people have stood up to lead interval and tempo sessions as well as those who lead the regular more social runs. All in all I feel that the club is heading in the right direction as we cater for all abilities and our beginner graduation days are just so well supported by existing members people can’t fail to not want to become a red roser. The only thing which I can find to gripe about is the number of stripey socks. They are getting harder to spot. Interclubs used to look like an episode of where’s wally. Come on peeps let’s have all that red and white back out of the drawers and don’t forget the golden rule, ‘any marshal deserves a grunt, nod, high five or simply a thank you’. I will always remember Stu for encouraging me to run the ‘longer’ run when I first joined and we ran up Denham Quarry…around 9 miles. 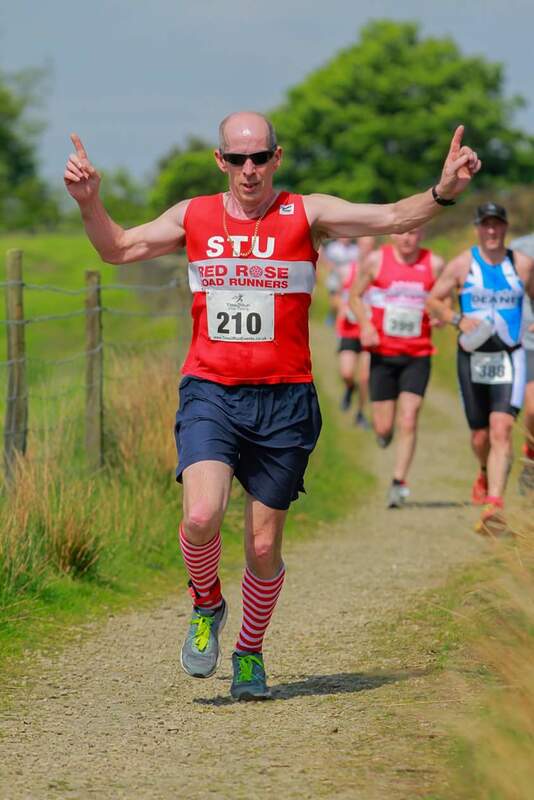 Stu is a great guy to be around, always cheerful, great company and great to have in our club. Thanks Stu!